The Somervell and Mier Expeditions of 1842, culminating in the famous "black bean episode" in which Texas prisoners drew white or black beans to determine who would be executed by their Mexican captors, still capture the public imagination in Texas. But were the Texans really martyrs in a glorious cause, or undisciplined soldiers defying their own government? How did the MThe Somervell and Mier Expeditions of 1842, culminating in the famous "black bean episode" in which Texas prisoners drew white or black beans to determine who would be executed by their Mexican captors, still capture the public imagination in Texas. But were the Texans really martyrs in a glorious cause, or undisciplined soldiers defying their own government? How did the Mier Expedition affect the border disputes between the Texas Republic and Mexico? What role did Texas President Sam Houston play? 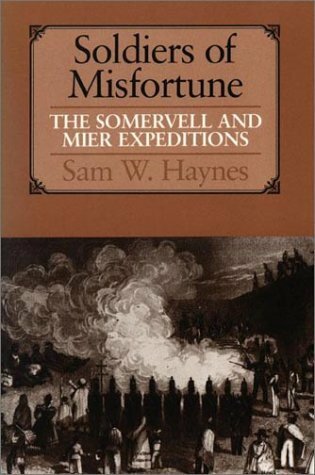 These are the questions that Sam Haynes addresses in this very readable book, which includes many dramatic excerpts from the diaries and letters of expedition participants. Soldiers of Misfortune examines the failed Texas invasion of Mexico. The captives were forced to draw beans to see who who be shot.